Uncategories 'Tis the Season for Getting? I have so much to be grateful for this Thanksgiving. I have wonderful family and friends both near and far. Watching the news gives you the feeling that everything is wrong. But it is our challenge to move away from fear and worry, have faith and do the best we can as we care for each other. I owe a "ginormous" ;-) thank you everyone of my friends and a special thank you to several of them that are dear to me. Every day comments and interaction from my blog give me encouragement and joy. Life has been very hectic and challenging lately and I've neglected visiting my regular blogs and seeing what is going on but this weekend I'm going to get caught up with e-mails and posts in my google reader. And speaking of holidays . . . Christmas came early this week. 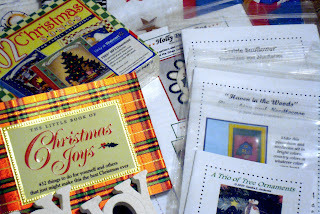 My friend Sandi at A Legacy of Stitches sent the biggest early Christmas extravaganza box to me. Here are a few of the thoughtful things she included in her box. There was a letter telling me what everything was and how to proceed through he contents. Sandi is so kind. 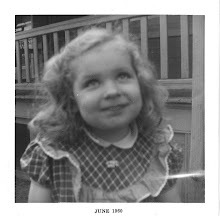 She is also a vocalist, writer, quilter, artist and pattern designer. 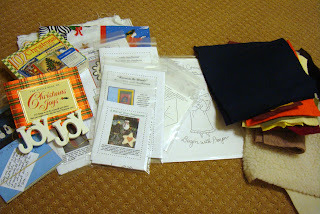 She sent me some of the patterns that she has designed and other goodies for me to enJOY. 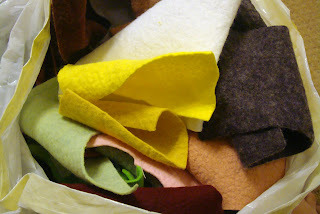 Contents in the box were wrapped up and cushioned in this huge bag of felted wool. I've not had a lot of experience using felted wool very often but I've loved seeing things others have created with it. So now I have an opportunity to do the same. Cradled inside the felted wool were these 2 boxes with the vintage creamer and pitcher. You can see why she sent them to me. Beehives and Vintage! They are really darling and will hold a special place on my sewing room shelf. Thank you so much Sandi, words aren't enough. 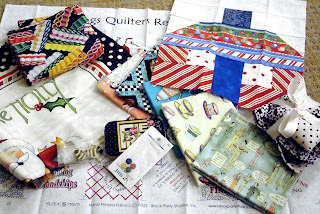 Jane of Jane's fabrics and Quilts also sent me a box of quilting treats. If you don't know Jane, you are missing out. Jane is such a willing and supportive friend. And she seems almost clairvoyant and always makes me feel special. 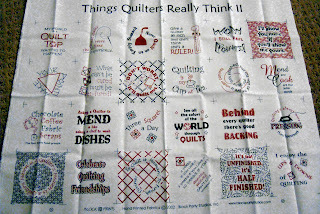 Look at this funny/true group of quilter's sayings she sent me. I love it. Can't you see pincushions and fun treasures using these cute quips. Here is some of the loot - darling stuff all of it with me in mind. And Jane made me a very special cottage block. Now look at the little ribbon candy fabric in the left upper corner. I mentioned to Jane how cute the fabric was in a post she made a week ago. I certainly wasn't fishing to have her send it to me but she did and so much more! 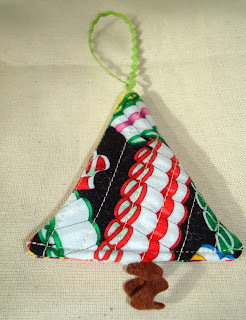 I wanted to use it to make more of the little tree ornaments I've been working on. The ribbon candy reminded me of vintage Christmases from my memories and something kids might have found in their stocking many years ago. It worked out "sweetly" in my trees. I can't thank you enough Jane, for everything. 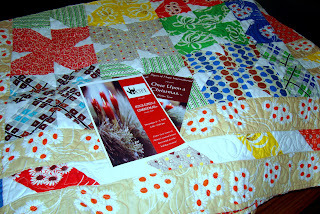 Last night was our local quilt group meeting and I took lots of pictures to post later. But Kim caught me in the hallway as I was leaving and handed me this sweet gift and a big hug. Thank you Kim. Your work is perfection on everything you do. I'm so proud to have a Kim "gem" to tuck in my purse and use. And just like Jane's fat quarter of quilter's saying goes Chocolate is included as one of a quilter's basic food groups, especially Dove chocolates! In light of all the Joy sent to me I would be remiss if I did not give to others. Melissa Jones (the sweetest girl) is involved in a great children's charity called Signs of Hope here locally. And I'm so happy to donate a couple quilts to this needful cause. I know this year charities are hurting as well. It is important to show gratitude by giving. Thanks for this opportunity, Melissa, and I wish you much success in your year long efforts for the upcoming event and I wish you all the support of local folks. 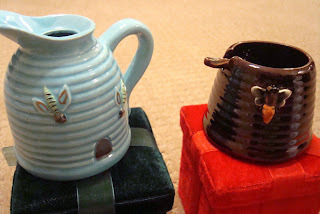 I am "sew happy" to see the little creamer and sugar bowl (or honey pot-I was never sure what it was for) has made you smile. It was meant just for you. 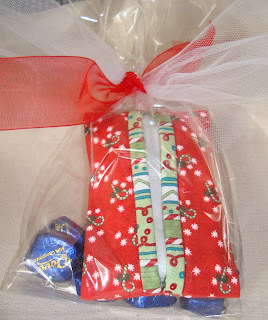 I love the gift that you give to all of us with your wonderful blog, great photos and the fun cottage block exchange. You deserve every gift and package that you get in the mail.......or handed to you as you leave a quilt meeting!!! Have a great, good Thanksgiving!! 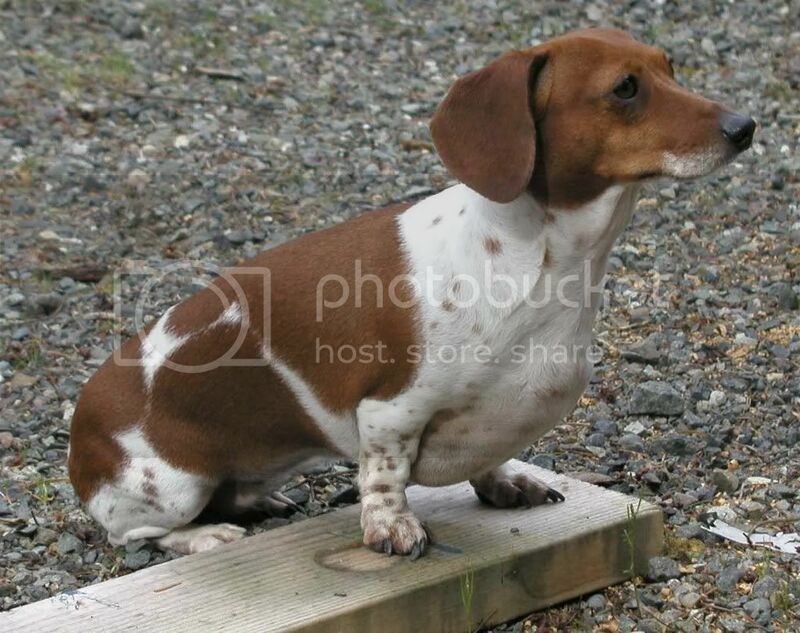 Nanette, Sandi is quite right...the gift you have given us with your blog gives us many happy returns! What wonderful presents you have received, and deservedly so! Happy Thanksgiving! Cheers! Lovely goodies for a terrific and giving person. Happiest of Thanksgivings to you. Fantastic treasures for a fantastic person. The vintage creamer and pitcher are perfect! By the way, I got the kit I ordered from you today. It is fantastic! Thank you for the cutest scented ornament you included. Happy Thanksgiving! A wonderful post and what great gifties you received. Happy Thanksgiving to you and your family Nanette!!!!! I loved seeing all of your wonderful goodies. You are very deserving! you received some lovely treats. I am sure you will put them to good use. You deseserve them all for all the kindness you share with your blog friends. Happy Thanksgiving. What wonderful gifts for someone who is so deserving!! The creamer and pitcher are fantastic! And a very very happy thanksgiving to you too dear nanette - you know what they say, you reap what you sow and you share so much friendship and joy that you deserve all you receive in return. I hope you are having a truly lovely time with your family. Stopping by to say Happy Thanksgiving. Thanks for being a wonderful bloggy friend. I love the little tree ornaments. What loverly gifts, each and every one! You are a much-loved lady, Nanette, and I totally understand why! The vintage sugar and creamer have won my heart - I will have to look for those when I go antique-ing again! How wonderful of you to donate your quilts for charity. that's one reason you are much-loved. Love the Honey pots, I collect them myself, what a wonderful gist.